If you require medical attention when the surgery is closed you should telephone one of the numbers given below. You can also ring the normal surgery number (01942 481531) and listen to the answer machine message to hear these contact numbers. Always have a pen and paper handy when you phone so that you can take down the numbers. 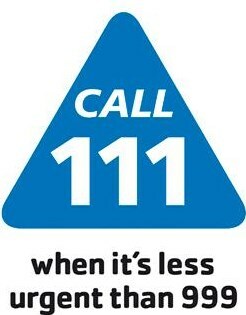 If you need urgent medical attention please phone NHS111. If you only need advice or are unsure if your need is urgent, you can phone NHS 111 on 111 and speak to a qualified nurse who will be able to advise you on the best course of action. For Accidents and Serious Emergencies you can also attend casualty at Wigan Infirmary, Wigan Lane Wigan (tel: 01942 244000 OR 999) 24 hours per day seven days per week. A GP is not appropriately trained to deal with dental problems. This includes toothache, abscesses and problems experienced after dental treatment. We cannot provide antibiotics as it is necessary to have a full assessment before prescribing such things. We would therefore respectively suggest patients register with and attend regularly a dentist who can provide appropriate routine and emergency advice. Dentists offer a 24 hrs per day emergency service. Out of normal surgery hours, this service is only for urgent dental treatment that cannot wait until the next working day to be treated. If you are not registered with a dentist, or are away from home, please ring NHS 111 on 111 for out-of-hours information. Alternatively locally the PCT has a service which can be accessed via 01942 614390.